According to the latest tally from metrics firm comScore, Android was the only platform to show growth among U.S. smartphone platforms in the three months ending in July. During that period, 41% more U.S. smartphone owners were using phones powered by Google's open source OS, than in the 3 month period that ended in April. As a result, the OS now owns a 17% slice of the U.S. pie, up from 12% in the previous report. 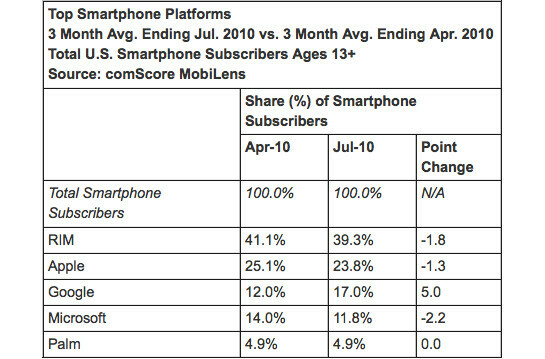 As the only OS showing growth this summer in the states, Android jumped over Windows to third place among competitors. RIM leads the way with a 39.3% share, down from 41.1% in the April report. Apple slipped from 25.1% to 23.8%, still holding on to second place. Windows now has 11.8% of the market, down from 14%. Palm's webOS was unchanged during the three months and owns 4.9% of the pie. While surpassing RIM will be the eventual goal for Google, the next step would be to overtake Apple and while that might not be accomplished by the end of the year, it certainly seems in sight for 2011. Very misleading tagline. All have actually grown in total subscribers because the whole smartphone market has grown so much. Only that Android has grown more than the others; thus, giving it a larger market share than previously (at the expense of others' market share). I know this argument is kind of like when Pres. Regan said that interest rates were going "up" but also "down" in the same sentence during a debate in the 1980's (he was referring to the slope of the interest rate curve over time - and that was just too much for most Americans who have difficulty balancing their checkbooks), but I think everyone knows what I'm talking about here. I'm wondering why they have the total smartphone subscribers listed at 100%, yet those 5 percentages don't add up to 100%. What's the other they're not listing or are they banking on a ~3% margin? It also could mean that if the smarphone market weren't growing that the Android OS could be taking an even larger slice of the pie. In other words, poeple should stop focusing so much on numbers as their meaning can easily be swayed one way or the other. Just get some hands-on time with a handset at a retailer, if you can, and buy what best fits you based on your own criteria for costs, funtion, design.